The Gophers plucked two football recruits from Alabama this year, and if you’re wondering how on Earth that happened, it starts with a recruiting staff spending countless hours, studying video and establishing contact with the right players. It includes the tireless efforts of assistant coach Jay Sawvel, one of the team’s top recruiters, and of course, head coach Jerry Kill. 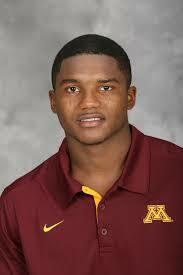 But the Gophers have a secret weapon now, too. His name is KJ Maye. When Maye signed with the Gophers in 2012, out of Murphy High School in Alabama, it was a rarity. From what I could gather on the Rivals.com database, Maye was just the second Gophers signee from Alabama since 2002. The other was Ralph Spry, who lasted two seasons under Tim Brewster before leaving the program. Maye has yet to make a huge mark on the field for the Gophers, as he was limited with a sports hernia as a sophomore last year. But the former high school quarterback looks like he’s back to full speed after surgery. He has been the team’s best slot receiver in spring camp. Listening to offensive coordinator Matt Limegrover on Tuesday, I started to realize Maye’s importance to the team. “He’s such a positive vibe guy that we missed some of that [last fall] -- his athletic ability, his positive energy -- we’re just happy to have it all back right now, without a doubt,” Limegrover said. The fact Maye is having a good experience at Minnesota only helps the Gophers with recruiting. This year, they signed Jerry Gibson, a 6-3, 220-pound tight end out of Theodore, Ala., who had an offer from Steve Spurrier at South Carolina. Moore was committed to Southern Mississippi but flipped his commitment to the Gophers. It’s not just Alabama. Over the past two years, the Gophers have signed five players out of Georgia, thanks to the recruiting of assistant coach Brian Anderson. That list includes WR Donovahn Jones, S Daletavious McGhee, CB Jalen Myric, LB Jonathan Celestin and RB Rodney Smith. Those players might love everything they hear from the coaching staff, but it helps when they can hear it from a player from that part of the country, too.